battenburgbelle.com » Happy New Year! Anyway, here’s hoping for good news in 2017, after a very rocky 2016 (globally, rather than personally). 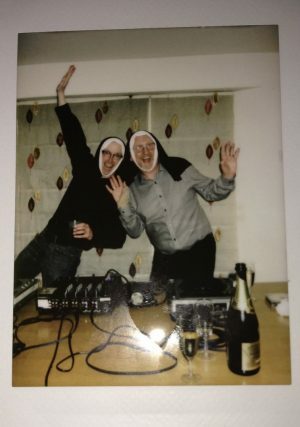 2017 certainly got off to a rip roaring start at Battenburg Towers, where we accidentally had a bit of a party. Long story, but very glad to have hosted a fun event. I managed not to over-cater as much as I sometimes do and I was pleased with the results. Still working my way through a large amount of left over cheese, kindly donated by one of the guests. So if you are local and you fancy some cheese on toast, just say the word! There are some traditions for festive knees ups here – Mr S (or, as he is now known, Sir S (!) – another long story) bakes a ham, I forget to take a photo of it, we send some guests home with some of it as it’s so big. The rest of the cooking falls to me. Although Missy B did sterling work opening packets of crisps, nuts and chocolate mini rolls (that always makes me weep slightly when there’s so much homemade loveliness to choose from). I decided to do two salads – both from Ottolenghi books. 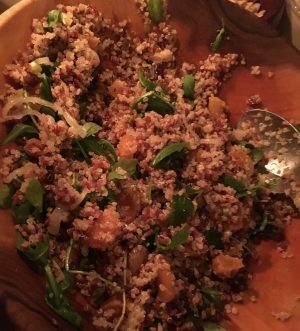 There was this quinoa and red rice salad, which I’m sure I’ve written about before and which I LOVE. 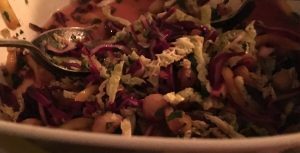 I made Mr Ottolenghi’s sweet winter slaw as well – this is healthy, sightly spicy and very delicious. And, on a frugal note, I used up the remainder of a savoy cabbage I was lucky enough to win in the post-Christmas family tombola (11 of us de-camped to deepest Essex for a few days and, in keeping with family tradition, we divided up the leftovers in a heated and rowdy session). I also got some sprouts, a very nice pack of biscuits for the aforementioned cheese, half a bag of posh cheesy crisps, a toilet roll and some sultanas. I turned to Denis Cotter for a couple of quiches. I’ve made his leek and blue cheese one before – I’ve adapted his recipe. He literally fills it with leeks and blue cheese. But I think it benefits from a custard as well. It’s lovely but not especially photogenic. So no picture. 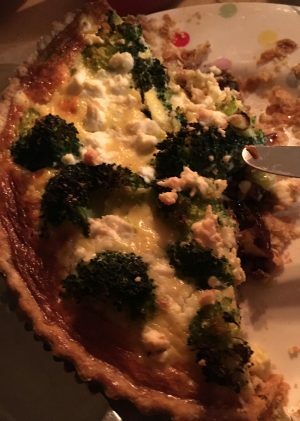 I also tried for the first time his caramelised onion, broccoli and feta tart. I have no idea what it was like as it all disappeared astonishingly quickly. Which I guess amounts to a ringing endorsement. I’ll make it again soon, but this is what it looked like. I had a lot of egg whites in the freezer, so I whipped up a pavlova and filled it with festive looking fruits – most delicious. Failed to take a photo of that. Nothing to do with alcohol consumption, obviously. Howdy y’all – it’s International Day of the Cowboy!